Still image from Edith V. Holocaust testimony, July 12, 2013. SynopsisEdith V. was born close to Košice, Slovakia on March 28, 1915. She describes her family. She describes her religious upbringing and education. She recalls the Jewish community. She recalls meeting her husband, moving to Khust, and the birth of her daughter. Edith describes her husband’s forced labour. She recalls ghettoization and increased antisemitism. She recalls the conditions of the ghetto and describes daily life. Edith describes deportation to Auschwitz in 1944 and the conditions of the camp. She recalls being separated from her husband and child. She describes her transfer to Ravensbrück and deportation to a munitions factory for forced labour. She describes violence and hospitalization. 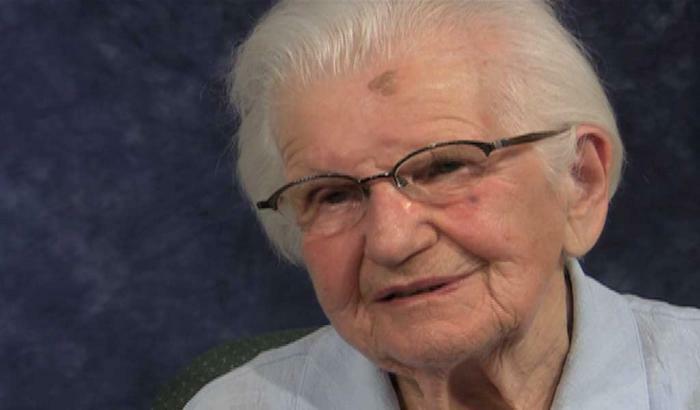 She recalls transfer to Hamburg and being kept in a school building near the end of the war. Edith describes receiving assistance from other prisoners and guards. She describes transfer to Padborg, Denmark and liberation by Russian troops. She recalls reuniting with her husband and returning to Prague then Košice. She describes life after the war, learning about the fate of her family, and having children. She recalls Russian occupation of Czechoslovakia in 1968. She describes immigrating to Canada. Edith speaks about sharing her Holocaust experience. She discusses her faith.